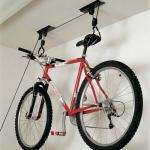 Ideal for storing your bike as it holds up to 20kg. Like for like on amazon for £19.99, so thought this was pretty good. Upto £30 in some bike shops. Aldi's website have the deal brochure if you want to see it. ALDI Glasgow Robroyston had 50 plus on the shelf/basket. These work really well - even if you don't use the whole kit the rope and hooks are worth the £5. I have mounted one set of the supplied hooks to the ceiling (of my garage) and lift my lightweight racing bike front wheel onto it. nice, can i take the weight of a nuahgty small child?? Or buy 2 to support an adults body! Did this 7 months ago & the wifes still up there in the cellar. System also took the added weight of the rug she was rolled up in with no probs at all !! These are great, got two up in our garage and they are absolutely excellent. picked up some V-Type brakes for £2.99 bargain! I just bought one of these, but due to the lack of height in the garage, the bike wheels would be below head height, so not a good idea for the bike. However, I like the idea about using for a ladder. My ladder is fairly inaccessible and this would solve the problem. Thanks for the idea! I just bought one of these, but due to the lack of height in the garage, … I just bought one of these, but due to the lack of height in the garage, the bike wheels would be below head height, so not a good idea for the bike. However, I like the idea about using for a ladder. My ladder is fairly inaccessible and this would solve the problem. Thanks for the idea! This is great just to get the bike off the ground and from rubbing the handle bar or brake against the wall. Even 4ft is ideal, get your wood and screws out and make a nice custom roof rack and cycle carrier unit. I've got a couple of these. They are OK, well worth £5, but they aren't perfect. It took a lot of fiddling about to secure these to the rafters in my garage, I spent more than £5 on coach screw and bolts! Also, depending on the design of your saddle, the way it holds the rear of the bike can be a bit precarious. ALDI usually have loads of these. If not, got to LIDL they sell exactly the same product for £4.99 too. Got two of these at Aldi Wellington loads in stock as well as all the other cycling gear, now just have to search through the garage and find the bikes. I spent more than £5 on coach screw and bolts!Also, depending on the … I spent more than £5 on coach screw and bolts!Also, depending on the design of your saddle, the way it holds the rear of the bike can be a bit precarious. Coach bolts? Are you hanging a kawasaki? Fixings are included, for wood or concrete. And depending on you joist centres you will have to dwang some cls in there. I have two of these fitted, they are just ok, the saddle has to be just right or it'll slide, I also use a bungee for extra security. The positioning of the fixings on the hoist is such that they are too far apart to go into the joists in the ceiling of my garage. I had to fix the hoist to a wider solid piece of wood which I fixed with coach screws into my joist. Its now very solid, and for the little extra investment i know my bike wont be falling down on top of my car! The original fixings were chucked in the bin, as they were a bit mickey mouse. But for the price, with rivals coming in as much as £30, its a steal. Bought these at the weekend and installed 1 so far. As others have rightly pointed out they are a great price BUT be warned that the holding hooks don't work with every saddle and they can slip off. I added a quick release hook and a small loop of quality rope to make sure the bike doesn't fall on the car! Also I tried to fix them to my sloping garage roof (they are not designed for this) and have to fiddle to release the pulley brake. I will change this for the next one by adding some wood between joists. Good product nice price. H&R! Thanks, OP - I just got one and there were about 6 left in the Felixstowe Road store in Ipswich. 2 for 2 skdotcom. more helpful comments, is there no end to your buying.